"Happy people don't get what they want - they want what they have"
Welcome back to another Motivation Monday post - I hope that everyone had a lovely weekend. Today I wanted to take a look at the power of positive thinking and share some ideas for overcoming and replacing negative thoughts. It's something I've been working on a lot recently and I believe that it's really key to practice being more positive both in your professional and personal life in order to move forward in a constructive way. Look for the light even in the darkest of situations. DON'T WORRY BE HAPPY - THE TOP 10! 1. Smile. It's simple but effective! Not only does remembering to smile lift you and relieve stress as well as create positive reactions from others around you it actually hurts far less than frowning! It relieves those stressed out tired muscles that put so much tense energy into feeling negative and can physically lift your spirits. 2. List five things that a). you've achieved recently or b). that have made you happy lately. Reminding yourself of what you have instead of what you don't can help to switch your mindset. Think about the good things in your life and don't focus on the bad. 3. Accept the past and move forward. Forgive yourself your mistakes or forgive the mistakes of others, no one is perfect. We have to learn to let things go and look to the future. It's an old adage but the past cannot be changed - learn from it but don't let it haunt you. If you really can't forgive then allow yourself to forget and move forward. 4. Surround yourself with positive people and good energy. Detox your life, if someone around you is constantly pulling you down, constantly takes but never gives anything back then as harsh as it might sound maybe it's time to say goodbye. Spend time with people who lift you up, who see the best in you and who give just as much as they get. Life's too short so go seek out positive energy and happiness. 5. Acknowledge negative thoughts then move on 'The Pink Elephant Theory.' Ok so I'm definitely not an expert on psychology but I have in the past been introduced to the Pink Elephant Theory and I found it really helpful. It's based on the idea that the more we try to suppress certain negative or unwanted thoughts, then the more they keep popping into our head - i.e. if you're told to close your eyes for 60 seconds and NOT think of a Pink Elephant then chances are all you will be able to think about is a Pink Elephant. Yet if you close your eyes and try to only think of a Pink Elephant for 60 seconds then chances are your mind will wander and you will start thinking about other things instead. To tackle this why not look a little into the practice of Mindfulness. Mindfulness has it's roots in Buddhism - the idea being that you become a casual observer of your own worries - let them go without making any attempts to push them away or get involved with them. For more information on this practice take a look at this article here. 6. Do something to help someone else, turn the attention away from yourself. Sometimes you just need to distract yourself and take yourself away from your own negative thinking and concerns. Try doing something nice for someone else and focus the attention away from you. Not only will you be helping someone out but it should give you a feeling of happiness and achievement as well. 7. Exercise. You probably know what I'm going to say here and it's true so even if you're an exercise-phobe like me it can't be avoided. Physical activity not only makes you feel better for the physical results that it may achieve but it also releases the feel-good chemical dopamine into your brain, a key contributor to your mental happiness. Getting out and getting moving also gives you the opportunity to clear your mind and refocus - so get off the couch and get moving. Check out these great - 6 Reasons Why Exercise Makes You Happy. 8. Sing - vocalise. Well this one might not suit everybody but for me having originally come from a Musical Theatre background a good old sing and getting the noise out can really help! Vocalising and having a sing along to the radio can be a great stress relief as well as take your mind off of other things. 9. Take a break and relax. Not much needs to be said here but sometimes you just need to take a break and do something to relax before refocusing and getting on with things again. 10. Search for the silver lining. Always look for the positive outcome in everything, question your natural inclination to think negatively - every cloud has a silver lining! Try a little harder to find it before you dismiss something as a failure. On the practical side of things I've also been trying out some herbal remedies that have actually been really helpful when it comes to calming down the over-thinking process. White Chestnut is said to be 'The remedy for unwanted thoughts and mental arguments that intrude into the mind and stop us concentrating.' I pop a couple of drops into my water or cup of tea first thing in the morning and I don't know whether it actually does something or it's just the will of me wanting to think that it does but it really seems to help me focus, grab the day by the horns and get on with things. 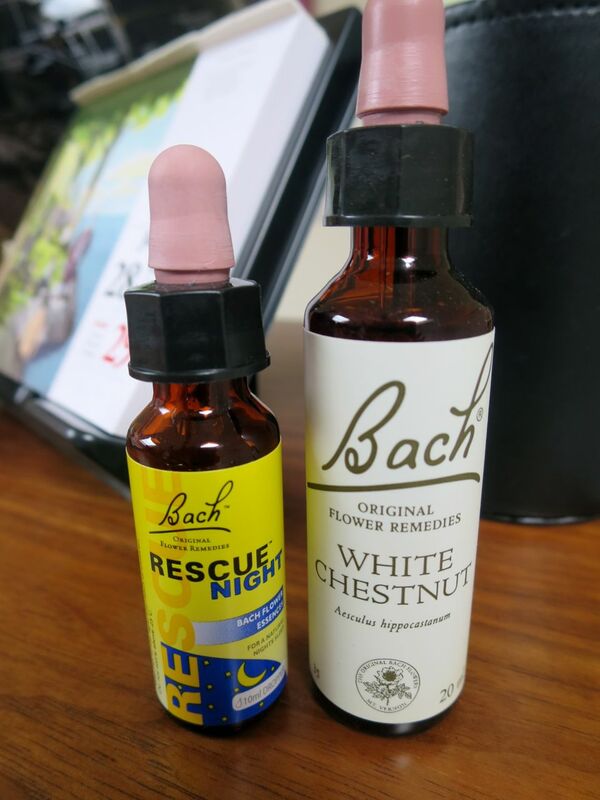 For trouble sleeping I also really recommend the Bach Rescue Night Remedy. Just a few drops of this before you drop off seem to really do the trick. This is a combination of 5 of the flower remedies and also includes White Chestnut. Obviously make sure you read and understand the ingredients and the uses of these remedies before you buy and try them but if you ever used to use the original rescue remedy to get you through your exams or driving test or all those other life events along the way then you might just remember how beneficial they can be and fancy giving them another go. What do you do when you're finding it hard to stay positive? Why not share some of your top tips in the comments below, it would be great to here more and learn from each others experience.